Third Quarter (Q3) of 2017 turned out be most productive period for VR Headsets as sales observed a record increase in 3 months. 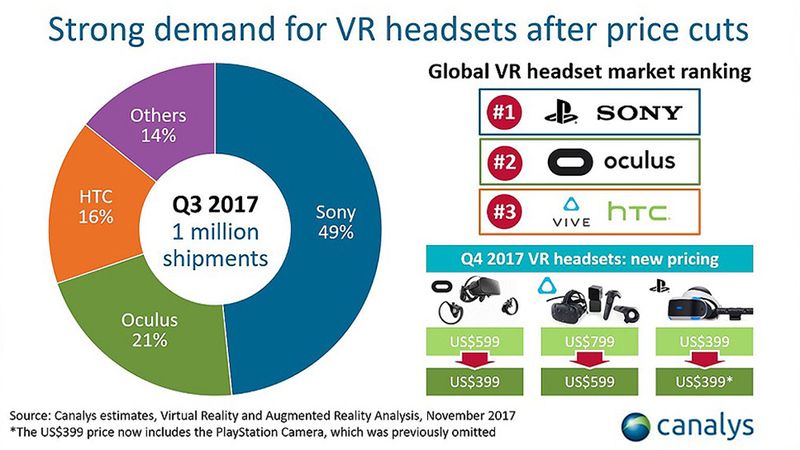 Over a million branded VR headset units were sold in Q3 2017 and the number is expected to increase further during the winter (Christmas) holidays. According to a report by Canalys, major price cuts in VR headsets is the main reason for a sudden boost in sales. PlayStation VR was the market leader shipping more than 490,000 head-mounted displays (HMDs) in Q3 2017. That was followed by Oculus Rift, which shipped 210,000 headsets, while HTC Vive took third place, shipping 160,000 units. Collectively, Sony, Oculus and HTC made up 86% of the total market in Q3 2017. The report stated that another reason for a sudden jump in worldwide shipments are things like ‘Experience Zones’ in Japan’s VR market, which allows the users to have a realistic experience of 3D games. Interestingly, Japan shares 80% of the PlayStation VR market. Sony has dominated the Japanese VR headset market since the release of the PS VR, taking more than an 80% share, and will continue to lead as it increases supply of the PS VR headset with bundles featuring new titles from popular franchises, including Doom, Skyrim and Gran Turismo. “VR in business can be applied to many industries, such as manufacturing, healthcare and education,” Low added. As the bigger vendors in the PC/laptop market like HP, Lenovo, Acer, Asus and Dell launch their own headsets, VR adoption will rise. This is due to having better distribution channels compared with the likes of Sony and Oculus. Conclusively, the increasing demand of relatively cheaper VR gadgets is further proof that consumers like budget-friendly products and are embracing the technology contentedly.